Help your heart, body and mind stay healthy with diabetes! Buy Yoga & Diabetes and Yoga for the Rest of Us: Easy Yoga for Diabetes with Peggy Cappy and SAVE! 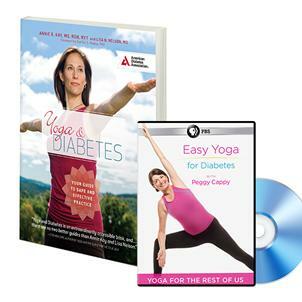 Yoga & Diabetes is the accessible guide for people with diabetes who want to begin or deepen their yoga practice. It provides tailored guidance to people with type 1, type 2, or gestational diabetes. Dozens of photos demonstrate specific yoga poses for the new and seasoned yoga practitioner. Sample practice plans and lifestyle tips illustrate how yoga can help you enhance your diabetes self-care. Whether you are a yoga pro or just interested in trying it out, Annie Kay and Lisa Nelson provide a yoga practice that will work for you and your diabetes. In Yoga for the Rest of Us: Easy Yoga for Diabetes, Peggy Cappy demonstrates her signature yoga approach in a daily workout for people struggling with diabetes or prediabetes. Divided into 7 separate segments, the exercises can be done at home, all at once in just over an hour, or 1 segment at a time. A growing body of research suggests that yoga can be helpful for people living with diabetes and/or at risk for it, paired, of course, with the right diet.